Minimal change disease (MCD) is a major cause of idiopathic nephrotic syndrome (NS), characterized by intense proteinuria leading to edema and intravascular volume depletion. In adults, it accounts for approximately 15% of patients with idiopathic NS, reaching a much higher percentage at younger ages, up to 70%–90% in children >1 year of age. In the pediatric setting, a renal biopsy is usually not performed if presentation is typical and the patient responds to therapy with oral prednisone at conventional doses. Therefore, in this setting steroid-sensitive NS can be considered synonymous with MCD. The pathologic hallmark of disease is absence of visible alterations by light microscopy and effacement of foot processes by electron microscopy. Although the cause is unknown and it is likely that different subgroups of disease recognize a different pathogenesis, immunologic dysregulation and modifications of the podocyte are thought to synergize in altering the integrity of the glomerular basement membrane and therefore determining proteinuria. The mainstay of therapy is prednisone, but steroid-sensitive forms frequently relapse and this leads to a percentage of patients requiring second-line steroid-sparing immunosuppression. The outcome is variable, but forms of MCD that respond to steroids usually do not lead to chronic renal damage, whereas forms that are unresponsive to steroids may subsequently reveal themselves as FSGS. However, in a substantial number of patients the disease is recurrent and requires long-term immunosuppression, with significant morbidity because of side effects. Recent therapeutic advances, such as the use of anti-CD20 antibodies, have provided long-term remission off-therapy and suggest new hypotheses for disease pathogenesis. In adults, minimal change disease (MCD) represents approximately 10%–15% of patients with idiopathic nephrotic syndrome (Figure 1) (1,2). In children >1 year of age, MCD is the most common cause of nephrotic syndrome, accounting for 70%–90% of patients; around puberty, this proportion decreases significantly as other glomerular diseases, such as membranous nephropathy, become more frequent (Figure 1) (3,4). The histologic picture of MCD is identical in adults and children. Because most children respond to steroid treatment, the disease is termed “steroid-sensitive nephrotic syndrome” (steroid-sensitive NS) on the basis of clinical features, and renal biopsy is not performed unless steroid resistance is observed. If performed, it usually shows the absence of significant changes by light microscopy (LM), a finding that has puzzled physicians for decades. When ultrastructural analyses were first performed in the 1950s, extensive fusion of podocyte foot processes was observed (5). Soon after, the term “lipoid nephrosis,” introduced in the early 1900s to describe the presence of microscopic lipid droplets in urine and tubular cells, was replaced by MCD, to highlight the existence of minimal alterations of the glomerulus by LM. However, a minority of patients that have FSGS lesions on their renal biopsy do respond to steroids and, conversely, patients with steroid-resistant nephrotic syndrome (steroid-resistant NS) may have MCD at disease onset, before developing FSGS lesions later in the course of their disease (6). Etiology of nephrotic syndrome according to age from 1 year onwards. (A) Minimal change disease. (B) Focal segmental glomerulosclerosis. (C) Membranous nephropathy. Data are approximated from Nachman et al. (1) and Cameron (2). Therefore, the terms steroid-sensitive NS on the basis of clinical features and MCD on the basis of histologic picture are not entirely equal. In clinical practice, however, especially in children who do not systematically undergo a renal biopsy, these terms are often used as synonyms. In this review, the term MCD will include all children with classic clinical features of steroid-sensitive NS in which a renal biopsy was not performed, and all adults with the histologic pattern of MCD regardless of response to therapy. The reported incidence of MCD in children varies between two and seven new cases per 100,000 children (3,7). The exact prevalence is not known, but on the basis of disease evolution and average age of onset, it can be estimated at approximately 10–50 cases per 100,000 children. The disease is slightly more common in Asia and has a male predominance (approximately 2:1) in young children that disappears in adolescents and adults (3,8). MCD is much less frequent in adults, but the exact incidence in this population is less well documented. Defining steroid sensitivity represents a first critical aspect for prognosis, as forms that respond do not evolve toward chronic renal failure. In MCD, unlike other glomerular diseases, steroid response when present is often complete, with total disappearance of proteinuria. However, time to remission is very different in children compared with adults. As shown in Figure 2, after a first episode, approximately 50% of children achieve remission within 8 days of steroid treatment and most patients who are going to respond to steroids do so within 4 weeks. In contrast, in adults the median time to remission exceeds 2 months. In both populations, MCD has a high tendency to relapse, and relapses tend to be more rapid in children. Time-to-response to prednisone is much shorter in children than in adults with minimal change disease. Data are extrapolated from references Waldman et al. (12) and Vivarelli et al. (82) for children (A and B), from references (83) and Chen et al. (84) for adults (C and D). In Table 1, a further classification of MCD in clinical subgroups on the basis of response to therapy, separating children and adults, is reviewed. This classification for children was initially proposed by the International Study of Kidney Disease in Children (ISKDC) (9) and has been adapted over the years (10). MCD accounts for the vast majority of idiopathic NS in children, particularly for the steroid-sensitive forms (3,11). In adults the picture is much more varied, with MCD being the third cause of idiopathic NS, after FSGS and membranous nephropathy (1,2,4). Thus, whereas in adults early kidney biopsy is crucial in driving the therapeutic approach (12), the indications for renal biopsy in children are limited to features that may suggest alternative diagnoses: at onset, age <1 or >12 years, gross hematuria, low serum C3, marked hypertension, renal failure without severe hypovolemia, and positive history for secondary cause; subsequently, steroid resistance or therapy with calcineurin inhibitors. By LM, no glomerular lesions or only mild focal mesangial prominence not exceeding three or four cells per segment are seen. The presence of more than four mesangial cells per mesangial region affecting at least 80% of the glomeruli defines the diffuse mesangial hypercellularity variant of MCD. These patients can present with hematuria and hypertension, unlike children with classic MCD (13). Immunofluorescence is usually negative. However, low-intensity mesangial IgM (sometimes accompanied by C3 or C1q) staining can be found (14) and MCD is occasionally accompanied by glomerular IgA deposits, a histologic picture that has been defined as IgA nephropathy with MCD (15). Focal segmental distribution of IgM and C3 staining should strongly suggest FSGS even when no sclerotic lesions are captured by LM, whereas more than trace amounts of IgG and IgA suggest alternative diagnoses. By electron microscopy, foot process effacement is the only morphologic feature of MCD. Other pathologic features automatically exclude the diagnosis of MCD, which is therefore a diagnosis of exclusion. Rarely, nephrotic-range proteinuria is discovered on a routine urinalysis, but most frequently the presenting symptom of MCD is nephrotic syndrome, characterized by edema, periorbital (often misinterpreted as allergic), of the scrotum or labia, and of the lower extremities (11). Anasarca may develop with ascites and pleural and pericardial effusion, leading to abdominal pain because of hypoperfusion and/or thrombosis, dyspnea (rarely), and cold extremities with low BP (11). Especially in children, severe infections such as sepsis, pneumonia, and peritonitis may be present at disease onset or during disease course because of Ig depletion and altered T cell function (16). Moreover, onset is frequently preceded by upper respiratory tract infection. Intravascular volume depletion and oliguria are also present, and concomitant factors (sepsis, diarrhea, diuretics) can lead to AKI, which is more frequently seen in adults (12), although it occurs in about half of children hospitalized for nephrotic syndrome (17). Rarely, AKI with gross hematuria followed by anuria can also be secondary to bilateral renal vein thrombosis. Gross hematuria is rare, occurring in 3% of patients (11). Laboratory analyses begin with urinalysis, with urinary dipstick showing 3+/4+ proteinuria (corresponding to ≥300 mg/dl on urinalysis) and, in about 20% of patients, microhematuria, which may resolve during remission of proteinuria. Urine collection shows nephrotic-range proteinuria (urine proteins >40 mg/h per m2 or urine protein-to-creatinine ratio >200 mg/mmol in children (11) and urine proteins >3.5 g/d in adults ). Blood chemistry shows a reduction in serum total protein and serum albumin, frequently <2 g/dl, with an increased α2-globulin and a reduced γ-globulin fraction. The reduction in serum protein leads to a reduced total serum calcium, with ionized calcium usually within the normal range. IgG is markedly decreased, IgA is slightly reduced, IgM is increased, and IgE is normal or increased. Hyperlipidemia is present, and is a consequence of (1) an increased hepatic synthesis of cholesterol, triglycerides, and lipoproteins; (2) a decreased catabolism of lipoproteins because of a decreased activity of lipoprotein lipase which transforms VLDL to LDL; and (3) a decreased LDL receptor activity and an increased urinary loss of HDL and proteins with anticoagulant properties, such as antithrombin III. Regarding hematologic parameters, hemoconcentration leads to increased hemoglobin and hematocrit levels, and thrombocytosis is frequently observed (11). This array of alterations (hypovolemia, hyperdyslipidemia, urinary loss of anticoagulants, and thrombocytosis) is worsened by an increase in circulating fibrinogen, factors V and VIII, and protein C, leading to a state of hypercoagulability and therefore to an increased risk of thrombosis, usually (97% of patients) venous thrombosis (18). Added risk factors for thromboembolic disease are infection, the presence of a central venous line, immobilization, and underlying genetic thrombophilia (11). It is as yet debated whether MCD and FSGS represent a disease continuum with a common pathogenesis or two separate disease entities. Excluding secondary forms of MCD (Table 2), the vast majority of cases arise in otherwise healthy individuals. Because the main histologic feature is foot process effacement, visible by electron microscopy, studies have concentrated on finding what disrupts the integrity of the glomerular filtration barrier. Figure 3 shows a sketch of this disruption and of some of the mechanisms that may contribute to determining it. The existence of one or more circulating factors capable of increasing its permeability, thus resulting in proteinuria, was first hypothesized on the basis of observations of the capability of plasma taken from nephrotic subjects to induce proteinuria in previously non-nephrotic subjects, and a vast body of literature in both human and mouse models has been accrued regarding FSGS (19). In MCD there is less clinical evidence of this, but the existence of a circulating mediator produced by abnormal T cells was postulated as far back as 1974 by Shalhoub, on the basis of the following observations: (1) remission may follow measles infection, which causes cell-mediated immunosuppression; (2) MCD may occur in Hodgkin disease, a lymphoid neoplasia; (3) MCD responds to drugs that suppress cell-mediated immunity; and (4) unlike other glomerular disorders, there is an absence of humoral (Ig and complement) deposition in glomeruli (16,20). This hypothesis was strengthened by studies showing that supernatants of T cell hybridoma lines produced from patients with MCD were able to induce foot process effacement and proteinuria in rats (21). Subsequently, a vast body of evidence has emerged implicating different aspects of T cell regulation and function in driving podocyte injury in MCD (20). These are reinforced by the therapeutic effectiveness of immunosuppression, both with prednisone and second-line steroid-sparing agents, as will be discussed below. In summary, these results (22,23) have shown an imbalance in T cell subpopulations during active phase of disease, with a prevalence of circulating CD8+ T suppressor cells that aggravate renal damage in mouse models of nephrotic syndrome (24) and a prevalence of a type 2 T helper cell (Th2; IL4, IL5, IL9, IL10, and IL13) cytokine profile in patients (25), which is mirrored by the spontaneous model of idiopathic nephrotic syndrome in the Buffalo/Mna rat (26). These observations fit with the clinical observation of an association between MCD and atopy, as allergies are driven by Th2 responses. Of all Th2 cytokines, IL13 overexpression has been shown to induce foot process effacement and proteinuria in rats (27). Certainly, no single cytokine can be considered pathogenic per se in MCD, but rather may play a role in the context of a complex network with multiple cellular and circulating players (28). Moreover, different lines of evidence suggest a reduced function of regulatory T cells in MCD in adult patients (29). Confirming this, MCD has been observed in immune dysregulation, polyendocrinopathy, enteropathy, X-linked syndrome, a congenital immunodeficiency with severe T regulatory cell hypofunction (30). Pathogenesis of minimal change disease: hypotheses. In the presence of a normal glomerular basement membrane (shown at the center), with healthy podocyte foot processes (light blue), serum proteins, mainly albumin, remain within the glomerular capillary lumen. Mechanisms, that are as yet not fully elucidated but are partly intrinsic to the podocyte and partly due to the presence of soluble mediators released by a disregulated immune system (see top of the figure and text), modify this integrity. 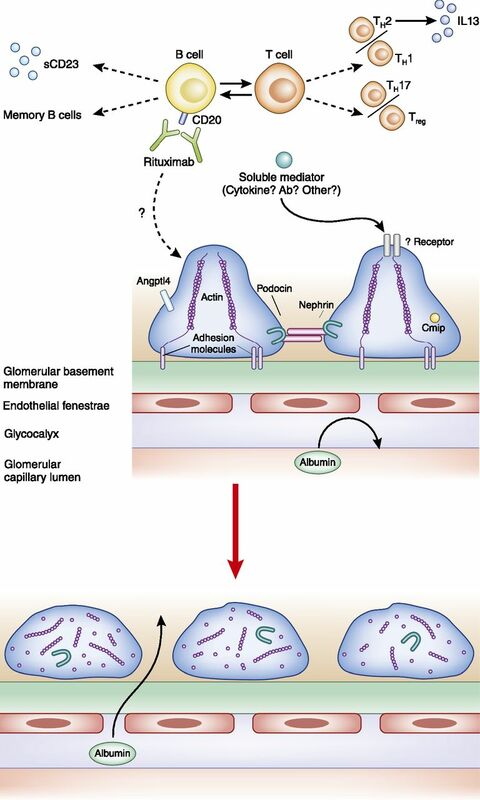 Therefore (red arrow), the actin cytoskeleton of the podocyte and the glomerular basement membrane are disrupted, and albumin and other serum proteins filter out of the bloodstream and into the urinary space. This leads to the intense proteinuria seen in nephrotic syndrome. In the last few years, clinical evidence of the effectiveness of B cell depletion via rituximab, an anti-CD20 monoclonal antibody, in different forms of nephrotic syndrome has suggested a role for B cells as drivers of disease. Looking back, multiple lines of evidence implicate B cells in the pathogenesis of nephrotic syndrome (reviewed in Elie et al. ): (1) total IgG and IgG subclasses display protracted alterations in nephrotic patients during remission; (2) MCD has been observed in diseases associated with monoclonal light chains, implicating altered Igs in disease pathogenesis; (3) plasma soluble CD23, a classic parameter of B cell activation, is increased during relapse; (4) measles virus also has an inhibitory effect on Ig synthesis; and (5) the immunosuppressors employed in the treatment of MCD have an antiproliferative effect on B cells, as well as on T cells. However, there are also lines of evidence against a direct role of B cells in MCD pathogenesis. First of all, by definition in MCD there is little or no Ig deposition on renal biopsy. In vitro, rituximab has been proven to bind directly to podocyte SMPDL3b and it has been suggested that its antiproteinuric effect may be independent of B cell depletion (31). Moreover, after rituximab infusion, some patients maintain prolonged remission despite reconstitution of B cells (32). Regarding this aspect, we have recently shown that after rituximab-induced B cell depletion in children with frequently relapsing nephrotic syndrome or steroid-dependent nephrotic syndrome, the reconstitution of memory B cells predicts relapse (33). Targeting B cells may affect costimulatory pathways involved in T cell activation, and this may well be one of the mechanisms involved in the effectiveness of CD20-depleting agents, such as rituximab and the newer humanized anti-CD20 monoclonal antibody, ofatumumab (34). In the last decade, studies have focused on the role of podocytes in determining proteinuria in MCD. A variety of interesting studies have investigated this aspect of MCD pathogenesis. One potential target of T cells on the podocyte is CD80 (also known as B7–1), a T cell costimulatory molecule expressed on antigen-presenting cells and B cells, which has been found in the urine of patients with MCD during disease relapse (35). Recently, however, the presence of CD80 on human podocytes during renal disease, including MCD and FSGS, as well as in experimental models of the diseases, has been excluded and the efficacy of recombinant CTLA4-Ig (abatacept and belatacept, which downregulate CD80) in reducing proteinuria was not confirmed (36). These results suggest caution and the need for thorough validation of preclinical results before passing from bench to bedside. Another mediator that has been implicated in the pathogenesis of MCD is hemopexin, a plasma protein that binds sialoglycoproteins in podocytes, leading to proteinuria and foot process effacement in rats and cytoskeletal rearrangement in human cultured podocytes (37). A key protein found to be upregulated in both MCD and FSGS is c-mip (reviewed in Ollero and Sahali ). Transgenic mice overexpressing c-mip in podocytes develop heavy proteinuria without any inflammatory lesions or cell infiltration. c-mip interferes with podocyte signaling, potentially leading to cytoskeletal disorganization and foot processes effacement. Recent studies have found that changes in the podocyte expression of angiopoietin-like 4 are able to induce proteinuria, foot process effacement, and dyslipidemia, another key clinical feature of MCD (39). Pathologic features of MCD may be found even in renal biopsies of patients with primary steroid resistance. In the vast majority of these cases, however, it can be safely assumed that the pathology will shift over time to FSGS (6). Therefore, for the purpose of this review we will consider MCD equivalent to steroid-sensitive NS. Treatment of steroid-resistant forms is therefore excluded from this review. In acute management, salt and fluid intake restriction is mandatory to improve clinical manifestations (edema) (40). Steroid treatment with prednisone or prednisolone, its active metabolite, are the primary drugs used at disease onset. There is no definitive consensus on the optimal dose and duration of therapy, which combines maximum remission duration with minimal side effects including stunted growth in children, obesity, osteopenia, cataracts, glucose intolerance, hypertension, and behavioral disorders (41). Therefore, in Tables 3 and 4 we have summarized different attempts to an evidence-based standardized approach in children and adults. In 1979, the ISKDC led to indications for optimal treatment regimen at onset of pediatric nephrotic syndrome (prednisone 60 mg/m2 per day for 4 weeks and 40 mg/m2 3 days a week for another 4 weeks ). Subsequent studies compared different therapeutic regimens of longer duration, most with an increase in total dose of steroids but some used a matching cumulative dose spread over two periods of different length. In the regimens where the total dose of steroid was increased, the probability of relapse after 12 or 24 months was lower, but not all of these studies were randomized and were often retrospective. On the basis of these results, the 2012 Kidney Disease Improving Global Outcomes (KDIGO) guidelines were issued (Table 2) (43). Over the past 3 years, however, the results of three prospective controlled studies have, to some extent, modified our point of view on the optimal therapeutic approach at onset. In summary, as evidenced in the most recent Cochrane review (44), extending the treatment regimen for >12 weeks total or giving higher doses does not significantly modify the onset of frequent relapses. Even greater uncertainty exists in the treatment of relapses. It is known that 80%–90% of children with steroid-sensitive NS have at least one relapse in their history of the disease. The most difficult patients to treat are those with frequently relapsing NS or steroid-dependent NS. KDIGO recommendations on the treatment of relapses are, in fact, made on the basis of levels of evidence that are never more than grade C or D (43). Despite the lack of controlled studies, the use of low-dose steroids on alternate days is recommended for frequent relapses (45). Interestingly, because of the extreme frequency of minor infectious episodes triggering relapse, three recent studies have been published confirming the clinical experience that in the pediatric setting, a low dose of prednisone switched from alternate days to daily at the onset of low-grade proteinuria is frequently sufficient in preventing a full-blown relapse (reviewed in Hahn et al. ). Children with MCD who develop frequently relapsing NS or steroid-dependent NS need steroid-sparing agents to reduce the secondary side effects of prolonged prednisone. Currently used agents are levamisole, alkylating agents, calcineurin inhibitors, antiproliferatives, and rituximab. Azathioprine, vincristine, mizobirine, and fusidic acid have also been used, though they are not currently recommended. The Cochrane review, updated in 2013 (46), provides a clear overview of studies assessing the drugs in use over the greatest number of years. Levamisole, an immunostimulatory drug with an anthelmintic effect in animals, is reported to increase time to relapse in frequently relapsing NS compared with prednisone alone, but in the absence of clear data from controlled studies, it is rarely used. However, a randomized controlled multicenter study (European Clinical Trials Database identifier 2005–005745–18) was recently completed, coordinated by the Dutch, on its effect in both frequently relapsing NS and steroid-dependent NS compared with placebo. These findings, once published, should indicate the ideal patients to treat with this drug. In our experience, levamisole can be a safe and effective steroid-sparing option in relatively mild forms of frequently relapsing NS. Alkylating agents such as cyclophosphamide (47) or chlorambucil (48), as well as levamisole, were some of the first steroid-sparing drugs to be used in this disease. In current clinical practice, chlorambucil is infrequently or no longer used. Many studies show that they reduce the number of relapses compared with prednisone alone, and that cyclophosphamide induces more prolonged remission in patients with frequently relapsing NS compared with those with steroid-dependent NS. In the 1990s, cyclosporin A (CsA) was introduced. It inhibits calcineurin (like tacrolimus; TAC) and thus blocks the activation of T cells, modifying the immune response. The first comparative studies published on this drug involved alkylating agents, showing no superiority of CsA versus chlorambucil (46) or versus cyclophosphamide (46). The fact that CsA is easier to handle (no need for frequent check of the blood count and no gonadal toxicity) and that alkylating agents seemed to be more effective in frequently relapsing NS than steroid-dependent NS, led to a preference for CsA, especially in steroid-dependent NS. Moreover, calcineurin inhibitors also act through a vasoactive mechanism and by modifying podocyte permselectivity, which also makes them effective in reducing proteinuria in some steroid-resistant forms (49). CsA is effective in controlling the disease over time, allowing prednisone discontinuation in many patients with steroid-dependent NS. Unfortunately, it has disadvantages, as many patients relapse after interruption and prolonged use leads to significant nephrotoxicity (50). TAC acts in a similar way but there are no studies on whether it is better than CsA (51). However, published and personal experience suggest that TAC can be a good alternative to CsA in adolescents, especially girls, as it does not induce hypertrichosis or gingival hypertrophy, side effects to which these patients are very sensitive, thus improving therapeutic compliance. An oral glucose tolerance test before starting is prudential (52). More recently, mycophenolate mofetil (MMF) has been used in MCD. It has an antiproliferative effect on both B and T cells. There are no superiority studies with regard to CsA, however, a post hoc analysis by Gellermann et al. showed that the disease control in patients with a higher plasma level of MMF (area under the curve >50 μg) was very similar to CsA (53). As for calcineurin inhibitors, the probability of relapse is very high after withdrawal. Apart from effects on the gastrointestinal system and bone marrow, which are very dose–dependent, the main advantage of MMF compared with CsA is that it is not nephrotoxic. This has made it the first choice in treating steroid-dependent NS, where a long history of disease is expected. The drug that has aroused the most interest over the last decade is rituximab. Rituximab is a chimeric monoclonal antibody that binds to the CD20 antigen expressed on B cells, thus inducing B cell depletion. Although there have been few randomized controlled studies, rituximab reduces drug dependency, allowing interruption of all therapy, though often only temporarily, as recently reviewed (54). In 2013, Boyer and Niaudet hypothesized that rituximab may change the dependence of nephrotic syndrome on steroids or CsA to dependence on rituximab itself, often requiring multiple infusions (55). Though its overall safety profile is reassuring (56), rituximab use in children is not without rare serious side effects: fulminant myocarditis, pulmonary fibrosis, fatal Pneumocystis jirovecii infections, severe ulcerative colitis, and severe allergic reactions (reviewed in Avner et al. ). We have shown that, in children with frequently relapsing NS or steroid-dependent NS, rituximab infusion determines a prolonged depletion of memory B cells (33), and have observed long-term hypogammaglobulinemia in a few patients. Therefore, prospective long-term studies are necessary to evaluate the effect of repeated infusions on immune competence in the pediatric setting. A new fully humanized anti-CD20 monoclonal antibody, ofatumumab, is available, which appears effective in some patients with multidrug resistance (34). Of note, live vaccines are contraindicated in patients receiving steroid-sparing agents and in patients receiving high-dose steroids; inactivated vaccines should be administered, keeping in mind that suboptimal response requiring a repeated dose may be an issue (40,57). In children, steroid resistance is defined as lack of remission despite therapy with oral prednisone at adequate dosage (see Table 3) for a number of weeks that is still controversial. However, because of the finding that 95% of children with steroid-sensitive NS respond to prednisone within 4 weeks (9), most centers declare steroid resistance after 4 weeks of treatment. At this point, in addition to requesting genetic screening for genetic forms of nephrotic syndrome and performing a renal biopsy, three intravenous methylprednisolone boluses followed by the introduction of a calcineurin inhibitor, most frequently CsA, are recommended (10). Oral prednisone is usually reduced to alternate days and gradually tapered until discontinuation within 6 months (10). Response to CsA, when present, is gradual, and has been observed even many months after the introduction of CsA in about 80% of patients (58). In about 30% of children, the presence of a genetic mutation determines the course of the disease (59), and in this case the chances of response to treatment are extremely low. Children that respond to CsA in subsequent relapses become steroid-sensitive (secondary steroid sensitivity). Some of these patients display prolonged remission with calcineurin inhibitors and can therefore be gradually shifted to therapy with MMF (60). In children who do not respond to CsA in 6–12 months, the use of TAC can be attempted in the absence of known genetic causes (61). Other therapeutic approaches have been attempted but response is uncertain. The use of rituximab is still controversial, appearing successful in some reports and one study (62), which was not confirmed in a subsequent open-label randomized trial (63). Other anecdotal therapeutic successes with ofatumumab are yet to be confirmed (34). Plasmapheresis and immunoadsorption may also be beneficial in some patients. In adults, most indications for the treatment of MCD are derived from clinical trials in children and from observational studies performed in patients of various ages. Despite two small-sized placebo-controlled trials showing no significant advantage with prednisone in inducing complete or partial remission in adult MCD, even in the long-term, KDIGO guidelines recommend oral prednisone at onset (evidence level 1C), since patients treated with steroids go more rapidly into remission than controls (64). In these very old studies, steroids were given orally but doses and schedules varied widely, ranging from an average of 25 mg daily dose in one study to 125 mg on alternate days in the other. No subsequent, well designed, and adequately sized controlled trials were conducted with oral steroids in inducing remission of the nephrotic syndrome. Therefore, the currently accepted induction regimen of 1 mg/kg per day (maximum 80 mg/d) or 2 mg/kg every other day (maximum 120 mg/d) for 16 weeks (minimum 4 weeks if remission is promptly achieved; evidence level 2C) is extrapolated from pediatric randomized controlled trials and observational studies in adults (12). Previous studies failed to show a significant benefit of intravenous methylprednisolone (20 mg/kg per day for 3 days) followed by reduced-dose oral steroids (prednisone 0.5 mg/kg per day) versus full-dose oral steroids alone (prednisone 1 mg/kg per day). In adults, there are no controlled studies defining the best regimen for tapering the prednisone after the initial response, and this remains one of the most controversial issue for therapy since slow tapering may increase cumulative steroid doses, but rapid tapering may expose patients to the risk of relapses (reviewed in Hogan and Radhakrishnan ). A reasonable compromise may be to taper prednisone by 5–10 mg/wk after remission over 8 weeks for a total 24-week period of exposure to prednisone (12). Many questions on treatment efficacy and safety remain unanswered regarding the optimal dose and duration of steroids and steroid-sparing agents on subsequent relapses in frequently relapsing NS and steroid-dependent NS (64–66). The use of alkylating agents or calcineurin inhibitors in frequently relapsing NS or steroid-dependent NS is determined on the basis of clinical studies in children or small observational studies in adults. In adults, cyclophosphamide was shown to be better than CsA in steroid-dependent NS, and even more in frequently relapsing NS, in maintaining remission (67). In a randomized controlled trial by Ponticelli et al. on 75 adults and children with frequently relapsing NS and steroid-dependent NS (31 were MCD), long-term outcome was better with cyclophosphamide versus CsA, with 63% patients maintaining remission after 2 years compared with 25% with CsA (68). On the other hand, adding CsA to steroids was found to induce remission more rapidly than steroids alone at first relapse (69). The optimal CsA dose is not established, however, KDIGO guidelines suggest a 3–5 mg/kg per day range on the basis of dosages used in these studies. Some patients may relapse once CsA is discontinued. Only one study has been conducted in frequently relapsing NS or steroid-dependent NS, showing that TAC was equally effective to intravenous cyclophosphamide in inducing and maintaining remission at 2 years in 26 adults who had been previously treated with prednisone at onset (70). MMF use has been reported only in small patient cohorts, showing efficacy in about 60%–70% of patients (71,72). KDIGO guidelines (64) suggest to use cyclophosphamide as a first-line therapy for frequently relapsing NS or steroid-dependent NS, or alternatively CsA, to preserve fertility and MMF only in patients intolerant to the other drugs (Table 3). Also, rituximab has proven to be effective in adults (73), and data from another frequent cause of nephrotic syndrome in adults, membranous nephropathy, in which rituximab is used as single agent, are encouraging even considering the long-term safety (74). A current evidence-based approach to MCD therapy in adults is shown in Table 3 and reviewed in Hogan and Radhakrishnan (65) and Canetta and Radhakrishnan (75). About 10%–20% of cases of adult MCD are steroid-resistant, defined as no response to 16 weeks of oral prednisone daily or alternate days, and in these patients a second renal biopsy may reveal FSGS. Treatment of steroid-resistant MCD should follow KDIGO guidelines for steroid-resistant FSGS (64). Genetic forms are much rarer than in children, but should be investigated in young adults and in the presence of positive family history, particularly regarding ACTN4 mutations (76). The mainstay of therapy in these patients are calcineurin inhibitors, but cyclophosphamide, both oral and intravenous, has also been used and proved effective in some patients (reviewed in Hogan and Radhakrishnan ). An open-label trial comparing TAC versus intravenous cyclophosphamide showed an effective and more rapid induction of remission by TAC (77). MMF, chlorambucil, azathioprine, ACTH, and rituximab have been used only in the setting of small case series with variable results. In children, after remission of the first episode of nephrosis, about 30% do not suffer relapses for 18–24 months, and this usually indicates that the risk of future relapses is negligible. Approximately 20%–30% progress to infrequent relapses and rarely experience more than three or four episodes in total, managed by therapy with prednisone alone. The remaining 40%–50%, more frequently children <5 years of age, will have a frequently relapsing or steroid-dependent course, with relapses during steroid tapering or soon after discontinuation, requiring second-line steroid-sparing therapy (3,12). Rarely, children with initially steroid-sensitive disease will develop secondary steroid resistance. This clinical feature is highly predictive of post-transplant recurrence (78). In adults, relapses are frequent, occurring in about 56%–76% of patients (12,79). In all patients with MCD, the occurrence of chronic renal failure is exceptional, providing the disease maintains its response to steroids. Usually, no relapses for at least 2 years from discontinuation of all therapy indicates permanent remission. Occasionally, patients can relapse several years after they have been declared cured. Long-term outcome studies of large cohorts of childhood onset MCD followed into adulthood show about 3% developing chronic renal failure and 16%–42% recurring in adulthood. The main risk factor for adult relapses is frequent relapses in childhood (41,80). The main morbidity of MCD at all ages therefore derives from the side effects of therapy discussed above, primarily immunosuppression and, regarding prednisone, inhibition of linear growth, worsened by urinary loss of thyroid hormones and IGF1–1 (11,41,81). Importantly, subjects with childhood-onset MCD who maintain frequently relapsing NS or steroid-dependent NS during adulthood are at major risk for long-term toxicity, not exactly quantified because of the lack of long-term observational studies, including sterility associated with cytotoxic agents, nephrotoxicity with calcineurin inhibitors, diabetes, hypertension, obesity, osteoporosis, and cataracts related to steroids, and solid or blood neoplasia because of prolonged immunosuppression (41,80). MCD is a typical disease of childhood, accounting for the vast majority of primary NS cases in children and for about 10%–15% in adults (1,3). Features common to all ages of onset are the renal pathology, the high prevalence of steroid-responsiveness compared with most other nephropathies and overall the favorable outcome. However, some relevant differences exist between children and adults. First, clinical features at onset: whereas in children and young adults, edema is the main clinical symptom inducing parents to seek health care, adults >60 years may frequently present with impaired renal function and hypertension (12). Patients with reversible acute renal failure, probably linked with higher proteinuria levels, are more frequent in adults than in children (12), although a recent paper shows that AKI is frequently seen in children with nephrotic syndrome seeking hospitalization (17). In addition, thrombotic complications because of a combination of hypercoagulability, increased blood lipids, and hemoconcentration occur in a small percentage of children (2.7%) and in a much more consistent proportion of adults (24.1%), most frequently at disease onset (18). Second, a male preponderance has been described in children (11), whereas a female preponderance has been described in adults (12). Third, in children the disease is usually idiopathic, excluding the trigger of infection, whereas secondary forms (Table 2) are more frequent in adults (1,11). Fourth, focal areas of interstitial fibrosis or tubular atrophy without the finding of sclerotic glomeruli do not exclude MCD in adults and frequently associate with chronic hypertension, particularly in the elderly, whereas in children these lesions strongly suggest the possibility of a FSGS that was not correctly sampled at biopsy. Fifth, the timing of treatment response is quite different in terms of both time to remission and response rate between children and adults. Children have a shorter time to remission, usually within days or weeks from treatment initiation, whereas adults require months to achieve proteinuria reduction (Figure 2) (12,82–84). Therefore, therapeutic protocols with steroids at onset differ in children versus adults, as reported above, and consequently the definition of steroid-resistant NS differs, as children are considered resistant after 4 weeks of full-dose steroids (Table 1) whereas in adults, 16 weeks of prednisone (1 mg/kg per day) are required to define patients as steroid-resistant NS. This occurs in adults in approximately 10%–30% of cases, mostly because of evolution to FSGS (12). Timing of relapses also differs, with children relapsing more frequently and sooner compared with adults. Interestingly, some children demonstrate initial resistance to oral prednisone but respond to additional therapies, such as methylprednisolone boluses or CsA. After discontinuation of therapy, these patients do not always relapse (9). Conversely, patients with onset of MCD during early childhood who maintain active disease in adulthood continue to present a relapsing nephrotic syndrome with the characteristics of childhood onset MCD. These observations suggest that MCD is not a homogeneous disease and that children and adults present different forms of the disease. A subset of children with a longer time to remission at disease onset may represent a subgroup with childhood onset adult MCD. MCD is a histologic picture than does not correspond to a single disease entity. It can be found in very different clinical settings, and at different ages in life. Therefore, recognition of distinct subgroups of patients with common clinical and laboratory features is essential in determining disease prognosis and in tailoring optimal therapeutic strategies. The authors wish to thank Dr. Andrea Pasini and Prof. Arvind Bagga for their thoughtful contribution. This work has been funded by the Associazione per la Cura del Bambino Nefropatico, which supports M.V. and L.M.